The U.S. Congress is on recess this week and next, which means it's time for a spring listing of upcoming town hall meetings. Below we have links to members of Congress from more than 25 states, which means that a good number of you should be able to find something going on in your area. 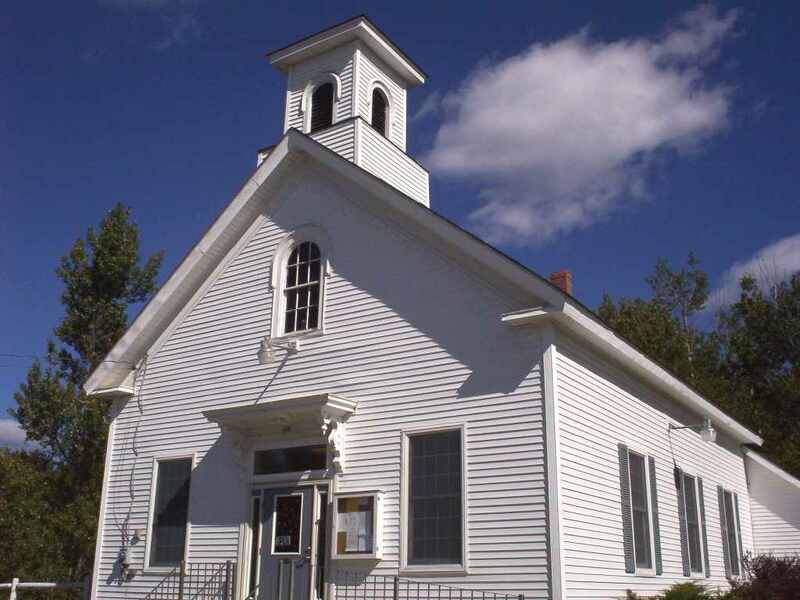 Make sure to let us know if you head out to a meeting - we'd love to hear about it! Rep. F. James Sensenbrenner, Jr.
For me, one of the worst feelings is waking up after 8 hours of sleep and still being exhausted. There can be many reasons why we are unable to recharge from time to time, but for many Americans that feeling of exhaustion can be caused by Chronic Fatigue Syndrome (CFS). The CDC estimates that at least one million Americans have CFS. The exhaustion associated with CFS can interfere greatly with work and personal lives. In the United States, the estimated annual economic impact of CFS is $9.1 billion dollars in lost productivity. This dollar amount does not even include costs associated with medical treatment or disability payments. 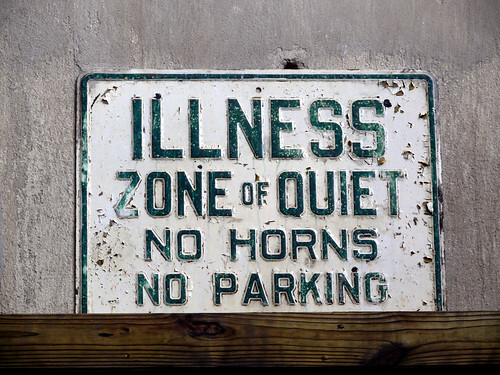 A major barrier to treatment for people with CFS is the stigma associated with the disease. For years, people have assumed CFS was not a real illness but simply symptoms manifested from another condition, like hypochondria or depression. People with CFS and other poorly understood "invisible illnesses" (illnesses with symptoms that cannot be seen) have the added challenge that employers and family members may not believe they are truly sick because from the outside they look fine. To this day, advocates have fought to legitimize CFS, which has included working to change the name of the disease. They argue that the name is imprecise because fatigue is not the only symptom of the disease, and they believe it affects a patients’ ability to get the care they need. Despite extensive research in search of a cause or diagnostic marker for CFS, much is still unknown. Studies, like one published by the CDC in 2006, have now identified biological abnormalities in people with CFS. However, scientists don't yet understand how these changes contribute to the symptoms. As I mentioned, a major challenge of invisible illnesses like CFS is that there are no outward signs of the illness. It is often challenging for a person with CFS to get the proper diagnosis for the symptoms. It is important that we remember that the problem they have, while hard to see, is very real. We should be careful our words reflect this fact. Comments, such as "I'm sure it's all in your head," suggest the disease is not a legitimate problem, when in actuality it can be debilitating. Make an effort to watch out for phrases like these when talking to people we know have invisible illnesses. Check out this fact sheet to see why Investment in research saves lives and money for those effected by chronic fatigue syndrome. President Obama signed a health reform bill negotiated by Congress into law this week. There's been a lot of discussion about it, so as we wrap-up the week, here's your open-thread to tell us what you think. Kathy Mitchell tells her tale of surviving tuberculosis in a New Jersey suburb on the New Jersey Voices Blog. 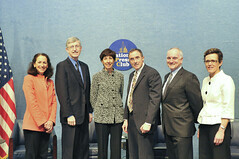 NIH Director Francis Collins talks to the Washington Post about health reform, genetic testing, and what effect specialty groups and his religion have on science priorities at the NIH. Three short reads, but all valuable examples of research advocacy in action. Tuberculosis, or TB for short is not something most people will think about today. But we should, which is why public health advocate Karen Goraleski is guest posting today to give us a little history about TB. More than 125 years after the discovery of the cause of TB we are still fighting this ancient killer. Even more incredible, we are using drugs and treatments developed nearly a half-century ago. The major burden of TB is found in developing countries, where 98% of TB deaths occur. In addition to killing people, it wields a double hit by draining $12 billion annually from the world’s poorest communities, where families caring for a loved one with TB spend eight to 20% of their income on treatment. Businesses and local economies must also cope with the absence of employees with TB, who will lose three to four months of work on average. We don’t think about TB here in the U.S., but we need to. In the 1980s and under a false sense of security, America relaxed its monitoring of TB. As a result, TB returned with a vengeance in the 1990s. Flash forward another ten plus years to 2007 and we have more than 13,000 TB cases reported. An increased investment in research to develop new tools to diagnose and treat TB is essential to prevent the needless suffering caused by TB and its often fatal drug resistant strains. Without this, TB can quickly overpower the current inadequate response to this long-standing but beatable disease. In this world where disease is just a plane ride away for all of us, where business and commerce are expanding globally, where students and youth groups routinely travel to distant places, it is critical for the U.S. to invest in global health research to develop better prevention and treatment for TB, and to find a definitive cure. Karen Goraleski is the vice president of public health partnerships at Research!America. For more on tuberculosis, check out this fact sheet. Think back to a time that you were so concerned about an issue that you took action. What did you do to make your opinion heard? As a kid, I always felt the word advocate carried a connotation that made it only applicable to people who took significant action to fight for a cause, like Martin Luther King Jr., for civil rights, or Rachel Carson, for the environment. However, I now understand that advocacy is simply taking action to promote change no matter how simple the action may seem. Advocacy includes a wide range of actions from the classics - such as lobbying, protests, and civil disobedience - to newer actions that are developing alongside technology. As the internet became a fixture of everyday life, we saw a rise of electronic advocacy, which can include spreading news on social-networking sites or using the internet to organize collective actions like email campaigns. Increasingly, events are being organized through viral marketing, which takes advantage our tendency to post information to sites like Twitter to disperse information through a self-replicating process similar to how viruses spread. A recent example of viral marketing includes mass actions organized for World Water Day. March 22nd was designated in 1992 by the United Nations as an international day to raise awareness about the world’s water crisis. This year, a large number of people celebrated World Water Day as advocates by participating in a global mass action. Thousands of people in over 72 countries stood up for clean water and sanitation by lining up behind a toilet. 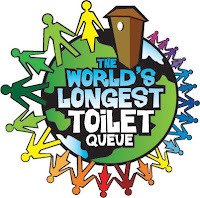 The purpose of this event, aptly called the World’s Longest Toilet Queue, was to bring people together to voice their support for international government action to fight the water crisis. This international event was organized promoted using social sites like Facebook and Twitter. A queue was even formed near New Voices neighborhood today, on Capitol Hill in Washington, DC! More pictures across the globe can be seen at the World’s Longest Toilet Queue’s Flickr page. The Toilet Queue wasn’t the only event held for World Water Day. Did any of you, our readers, participate in events? We’d love to hear about it! A week or so ago, we invited New Voices to attend Research!America's 2010 National Forum, Invest in Tomorrow. Invest in Research. It was an amazing event - and we'll all be telling you more about it soon. But as a recap, check out Kimberly's live tweeting on NV4Research and the podcasts of the panel sessions below. Moderator: Judy Woodruff, "PBS Newshour"
Paul Chew, MD, chief science & medical officer, sanofi-aventis U.S.
Robert Tjian, PhD, president, Howard Hughes Medical Institute. Jack T. Watters, MD, vice president of external medical affairs, Pfizer Inc.
View more photos from the 2010 National Forum. Last year we celebrated St. Patrick's Day with a post all about beer. As much as we love to celebrate with a tasty brew, sometimes it's nice to clink glasses with something else. * So today, New Voices is toasting a few of our other favorite beverages. It's good for your heart, it's got antioxidants, and it's pretty darn delicious too. In addition to making a great fuel for a fire if you're ever stuck on a desert island with Johnny Depp, rum is derived from sugar cane juice, which can help relieve sore throats. Antioxidants abound in this non-alcoholic beverage as well, but green tea can also decrease your overall cholesterol. Can't sleep? 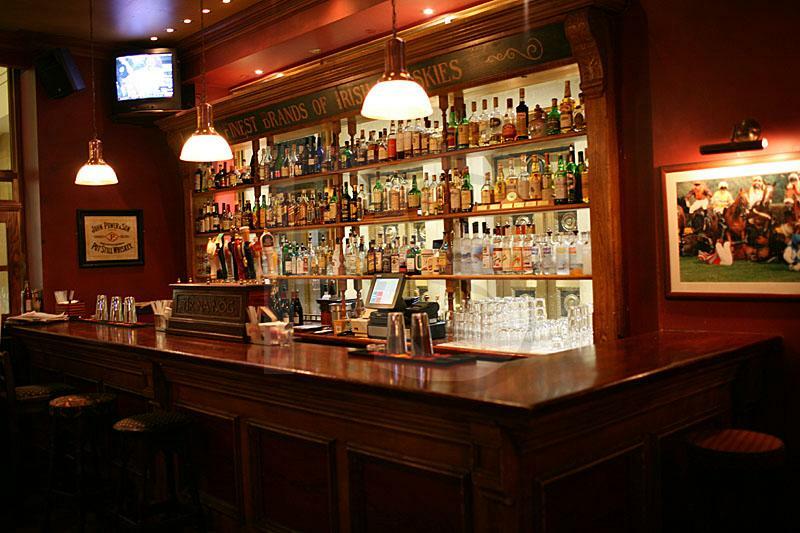 A shot of whiskey can help ease your transition to dreamland, especially when added to your hot beverage of choice. Taking a shot of tequila after dinner can help you digest your food faster. Long term studies have also shown that drinking moderate amounts of tequila can reduce your chances of dementia later in life. Did you ever notice it's hard to find peroxide when you get hurt? Turns out that if you can find your vodka first, it can also be used as a disinfectant. *If you plan on celebrating with alcohol this St. Patrick's Day, please remember that health benefits have only been found when alcohol consumption is in moderation. Also, check with your city to see if there is a special taxi service available or choose a designated driver. There is nothing I enjoy more than eating chocolate. Chocolate bars, chocolate covered fruit, chocolate ice cream, chocolate candy, or chocolate cake… I am a true chocoholic. Since it’s American Chocolate Week, I thought I’d celebrate by looking into the intimate details of how bad my addiction might be for me, how chocolate is made, and how far people will take their love of chocolate. Hello. My name is Sarah, and I am a chocoholic. Chocolate consumption has been linked to both positive and negative health effects. The cocoa bean used to make chocolate contains antioxidants which protect our body from damage. Chocolate also contains compounds that are shown to affect our mood by raising serotonin levels. However, these benefits need to be balanced against negative health effects from processing which can introduce high amounts of sugar and saturated fat. The healthiest choice is dark chocolate and is best in moderation. Where do you come from? Where do you go? Where do you come from cacao? Chocolate is made from cacao beans, which are grown on cacao trees. Did you know that cacao beans (also spelled cocoa beans) only grow within 10-15 degrees of the equator? Or that beans produced by a single tree can only make about 1 kg of chocolate per year? Also, the pods that contain the cocoa beans apparently grow directly from the tree’s trunk. The cocoa bean is used to produce a variety of types of chocolate. The Food and Drug Association has determined standard percentages for key ingredients in different types of chocolate. One of the main ingredients in chocolate is chocolate liquor, which is made by fermenting, drying, and roasting cocoa beans. The beans are then separated from their shells and ground into a paste that is melted to produce the liquor. The liquor is about half cocoa solids and half cocoa butter and can then be used to make both milk and dark chocolate. Milk chocolate must contain at least 10% chocolate liquor, while dark chocolate needs to be a minimum of 35% chocolate liquor. White chocolate is a bit different; it is made without using the cocoa solids. Instead of using the chocolate liquor, it is expected to contain at least 20% cocoa butter. On the other end of the spectrum is cocoa powder which is made by removing the cocoa butter. People love chocolate so much it seems they will try putting it on absolutely ANYTHING. Weird chocolate covered items I stumbled across included chocolate covered bacon, chocolate covered jalapeño peppers, and insects dipped in chocolate including scorpions and giant ants. Bacon and jalapeño peppers I will probably try… bugs… no thank you. What’s the strangest concoction you’ve eaten that includes chocolate? Since it is American chocolate week, which of the three well-known chocolate companies that got their start in America - Hershey’s, Mars, or Ghirardelli – is your favorite? Winter is my favorite season; but only for three reasons: my birthday is in February, I'm from the Midwest and I adore snow. Most people dread cold weather and the short days of winter, but the colder months can also be a time where some are more prone to sadness or depression. Seasonal Affective Disorder (SAD) is a type of depression that linked to seasons. People may find that in the winter that they have intense cravings for carbs, afternoon slumps, increased appetite with weight gain, and excessive sleepiness during the day. If you are diagnosed with SAD, treatments include therapy and exposure to special light that imitates sunlight. Scientists have been studying vitamin D, the “sunshine vitamin”, as a possible link to SAD. Since sunlight is decreased in winter months, Vitamin D levels can also decrease in the body. As of now, research is inconclusive about Vitamin D’s effects, but it’s still beneficial to ensure that you get your daily requirements in for good nutrition. Research shows that vitamin D can prevent colon and breast cancers, osteoporosis and heart disease. Some great sources of vitamin D are milk, whole eggs, tuna, salmon and mackerel. Growing up in Milwaukee, I knew spring was coming when robin red breasts started hopping around the city. 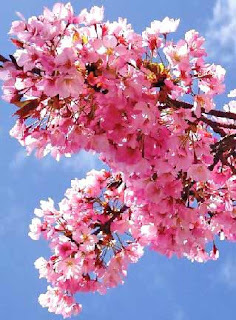 Since I’m new to the DC area, I hear the thing to do to celebrate the end of winter is to visit the Cherry Blossom Festival. What plans do you have to welcome back warmer weather? Did you know that the earliest documented use of an approximation of pi was by the Egyptians and Babylonians about 4,000 years ago? The first rigorous calculation didn’t happen until around 250 BC, when Archimedes used the method of exhaustion to approximate pi as 3.14185. Pi Day is coming up on March 14th. 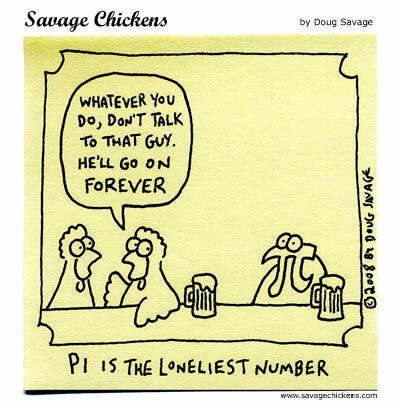 Pi is a constant that has an almost cult following. One mystery that has always baffled me is the obsession people have with memorizing the digits of pi. I even stumbled across a listing for ranks of reciting pi while juggling. To solve equations for my math and science classes, I always used 3.14 to approximate pi. But how close does this get you to the correct answer? Believe it or not, for most applications, 3.14 is a good enough estimate. However, if you wanted to use pi to calculate an extremely large circumference, such as one that fits the universe, 3.14 would not get you a very accurate answer. In fact, to calculate a circle of that size within the distance of a single atom, you still would not need to use more than 39 decimal places of pi. But that hasn’t stop mathematicians from competing to have the world record for most digits of pi calculated. Fabrice Bellard is a computer scientist who has recently claimed that he may hold the new record, having calculated pi to 2.7 trillion digits! A billion decimals of pi printed in standard font would stretch from New York City to Kansas. On Star Trek they rid the Enterprise’s computer of an evil entity by sending the computer into an infinite loop by ordering the computer to "compute to the last digit the value of pi." A great motto I try to live by is “everything in moderation.” But there some things that, even in moderation, are not safe. The second World War marked a dramatic increase in the production of synthetic chemicals; compounds that do not occur naturally. Man-made chemicals were developed to be used as pesticides, industrial solvents, and cleaning products. Initially, they were used widely without much thought about their impact on human health. Rachel Carson’s groundbreaking book Silent Spring changed everything. The book pointed to concrete evidence that chemicals, such as DDT, were having lasting impacts on the environment and health. Today we understand the potential adverse effects the chemicals we use every day can have on our bodies. Ensuring that they are safe for their intended use, however, has turned out to be a challenging problem. Increasingly, researchers are voicing concerns of possible lasting harmful effects on one specific group: our children. Experiments have still been largely unable to determine the exact consequences of chemical exposures during development and can only provide us with inexact correlations to a cluster of illnesses. The National Children’s Study has been developed to find answers for these unanswered questions. We are seeing the incidence of chronic diseases, such as asthma and obesity, occurring at rates never seen before. But we do not yet know if these illnesses are a result of our genetics, our exposure to environmental chemicals, or the interaction of the two. Understanding how exposures at critical periods impact our children’s long-term health will enable us to work towards the prevention of these illnesses. The National Children’s Study is designed to follow the development of 100,000 children from before their birth to 21 years of age. By sampling environmental exposures for a nationally representative group of children, it will attempt to determine a link between environmental factors and human health. Currently they are recruiting pregnant mothers in their first trimester. It may seem like a large commitment since there will be a study representative visiting your home to collect samples from you, your child and the environment until they are 21. However, the bulk of the visits will be when the child is young, and are predicted to be only every two years once the child is older. This is a landmark study that should revolutionize environmental health. Would you be willing to participate? Barbie ® is a registered trademark of the Mattel Company. All rights reserved. Barbie's first career was a teenage fashion model. Placed head to toe, Barbie and her family members sold since 1959 would circle the earth more than seven times. The first Black and Hispanic Barbies were introduced in 1980. Barbie has five sisters: Skipper, Tutti, Stacie, Kelly and Krissy. Every two seconds, Barbie is sold somewhere in the world. After graduating from Willows High School, Barbie has worked in the military, medicine, politics, public service, science and transportation. 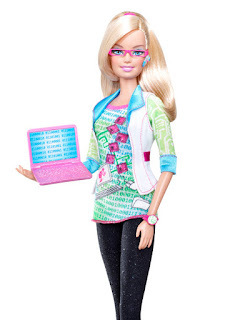 Last year, Barbie’s fans voted for her 126th career move--computer engineering. There is a huge gap in women that pursue engineering as opposed to men. According to the Society of Women Engineers, in 2002, approximately 50,000 engineering degrees were awarded to men, as opposed to 11,000 awarded to women. Women engineers are hoping that having Barbie as an ambassador will inspire more girls to want to become engineers. Mattel designers worked with real women engineers as well as the National Academy of Engineering to ensure that Barbie’s image was like that of a real engineer. She wears a binary code t-shirt, a smartphone (hopefully a low-radiation Blackberry), Bluetooth headset, laptop bag and a pink laptop. How can we continue to inspire the next generation to pursue careers in the sciences? I am so excited for ABC’s new show, Food Revolution! 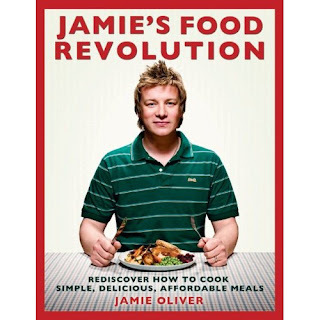 Jamie Oliver, a British chef, will tackle the obesity epidemic in Huntington, West Virginia; the unhealthiest city in America. In six episodes, he will try to change how America eats, in our home kitchens, schools and jobs and make people more aware of their personal nutrition. I can’t wait until March 26! When people hear the word nutrition, they often only think of it in terms of weight loss. Nutrition isn’t just for those who want or need to lose weight, but it’s also important for daily functioning. Since I don’t eat red meat, I have to make a conscious effort to incorporate other sources of iron into my diet. If I don’t, I find that I get tired more easily. Try new ways to eat fruits and vegetables. I find it very hard to remember to get all of my servings in one day. Instead of picking up a daily cup of coffee, try a fruit smoothie. If you’re always on the go, try Fruit 2-Day. One bottle counts as two servings of fruit. I also like V8 Fusion; an 8-ounce serving gives you one serving of fruit and one serving of vegetables. Shop at a farmer’s market. Farmer’s markets are the best places to get local and sometimes organic produce. The best times to shop are early weekend mornings, or mid-day during the week. Don’t forget to bring cash and a re-useable shopping bag! Go meatless! It may seem drastic, but try skipping meat for one day a week. Research shows that going meatless once a week can lower rates of heart disease and help maintain a healthy weight. There are lots of great meatless recipes, or switch your usual meat with another protein such as salmon, soy products or lean cuts of chicken and turkey. Grow a garden. I love the way fresh herbs taste! Cilantro, thyme, basil and mint can help spruce up your cooking and are relatively easy to grow your own herb garden on your windowsill. Besides helping flavor foods when cutting back on excess salt, fat and sugar, herbs may offer additional benefits of their own. Researchers are finding many herbs have antioxidants that may help protect against cancer and heart disease. Splurge in moderation. Eating healthier doesn’t mean that we should cut out all of the things that make us happy. Try substituting your favorite comfort food for something healthier. For example, instead of having tubs of cookies and cream in my fridge, I try to always have fruit sorbet on hand. This week, have a personal food revolution and try one of my tips for eating better. For more ideas and information on nutrition, check out the American Dietetic Association’s website. Happy healthy eating! New Voices is on Twitter! Follow us @NV4Research for the latest from the research community. It’s New Voices, in 140 characters or less. My parents are the reason I am interested in policy. From watching the national news after dinner every evening to attending protests, I was raised with an awareness of political happenings in the world. They also encouraged me to think independently about my views of current events, which apparently worked because we definitely don’t agree on every issue. Some differences, while very slight, were made abundantly clear during the 2008 presidential primary when my dad and I had multiple heated arguments over which candidate was a better choice for president. At a very young age, my political interests developed an environmental bend. Being determined to convey my concerns to people who actually made the decisions, I wrote a letter to President Clinton at 11 years old about US policies that promoted rainforest destruction. For my seventh grade science project, I doused 32 plants with common chemicals we use, such as antifreeze and dish soap, and charted the impacts on the plants’ growth. My mother claims she found this phase in my life to be extremely cute, but I'm not so sure she felt that way at the time. 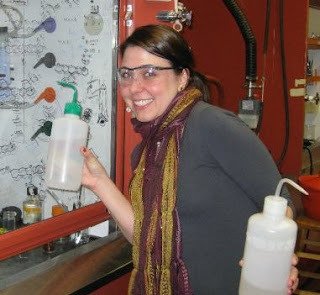 My interest in developing a scientific framework to understand science policy issues led me to declare chemistry as my major in college, which seemed to naturally blend into starting a graduate degree in chemistry in the fall of 2004. I quickly discovered lab work is an interesting mix of gut wrenching setbacks peppered with euphoric successes, making an interesting roller coaster ride. However, the part I enjoyed most was developing projects, which required me to learn absolutely everything I could about a topic inside and out and present a compressed summary to my research group. Early on, a senior graduate student in my lab suggested that because of my communication skills and interest in politics, I might enjoy a career in science policy. The idea took hold and I never let go. From that point forward, when people asked what I was going to do with my degree, I told them I was going to give science policy a try. 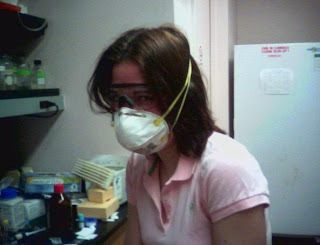 Fast-forward to 2009: I defended my dissertation mid-July and was faced with the hard reality that I had a great idea of what I would want to do for my career but had not yet found an appropriate job to begin the transition. The problem I was facing is that most political jobs do not consider 9 years in the laboratory as valuable ‘work experience’. So then just how was I supposed to ‘break into’ science policy? There was a general consensus among my fellow classmates who were graduating that no one really knew what they specifically wanted to do in the long run, but the majority prolonged the decision by starting down the standard career route of a chemist, which is applying for post-doctoral research positions. But I didn’t want to wait to begin studying the interface of science and policy, so I simply packed up my things and moved to Washington, DC where I began working as a legislative intern for a Congressman… for free. I had an amazing time on the Hill. During my internship, I recognized quickly that there are a whole new set of rules at play, which I am going to have to learn to navigate. A lot more goes into a policy decisions than the science. I made a few friends and learned a lot about the political process; however, a three month crash course was not enough to help me break into policy and I needed more opportunities. One incredible way for scientists to learn about the policy-making process is through a science policy fellowship. Probably the best known is the American Association for the Advancement of Science (AAAS) Science and Technology Policy Fellowship. However, there are many more opportunities and a long list has been conveniently compiled by Sheril Kirshenbaum of The Intersection. I was fortunate enough to become a Science Policy Fellow at Research!America. I’m really enjoying working for a non-profit organization, it has been a valuable learning experience. The question is, what am I going to choose to do with this? Six months ago I set out on my personal "road less traveled" (compared to a post doc or life in industry) and I had no idea where the adventure would lead. I couldn't be happier with that decision. I hope I have the same luck when I reach the next fork in my road. For those in the DC area, this a great opportunity to hear about policy. Research!America's 2010 National Forum will be the seventh annual discussion among nationally recognized leaders in health research - a "who's who" of government, academia, industry, media and patient advocacy. 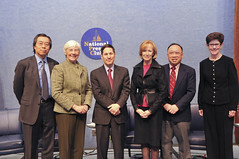 * Paul Chew, MD, chief science & medical officer, sanofi-aventis U.S.
Join us Tuesday, March 16, 2010 from noon to 3 p.m. at the National Press Club. Admission is complimentary for Research!America members, and $25 for others. * RSVP today! *Let us know in the comments if you're planning on coming, as all of your regular New Voices bloggers will be there and we'd love to meet you in person! • Americans eat about 700 million pounds of peanut butter each year. • Women and children prefer creamy, while most men opt for chunky. • People who become hysterical when peanut butter sticks to the roof of their mouth have 'arachibutyrophobia'. Other than as a healthy snack or sandwich spread, did you know that peanuts have LOTS of uses? African American scientist, botanist, professor and inventor George Washington Carver is credited with conducting years of research on the peanut. Carver’s 1916 research, How to Grow the Peanut and 105 Ways of Preparing it for Human Consumption, rescued the South’s economy. In the early 1900’s, boll weevils were destroying the cotton crops in Alabama. Farmers began to plant peanuts as their cash crop. Instead of cotton oil, mills were converted to make peanut oil. During further research, Carver found more than 300 new uses for the peanut. He invented peanut-based foods, beverages, medicines, household products and cosmetics. Some of his most surprising inventions include laundry detergent, mayonnaise, diesel fuel, glue, rubber, shaving cream and hand lotion. How do you plan on celebrating Peanut Butter Day?